At the Humber Bridge on a fall day with every weather possible. 10 years ago, as I write this now, I couldn’t sleep. Shannon was in bed, the rehearsal was done, there was nothing left to prepare. Just one last sleep and then we would get dressed for an event that would be the best day of our lives. And it was. With its own joys and a few disappointments, it was a spectacular day, with weather that was typical for an early October weekend. Now, in 2018, the day ahead promises even stranger weather than we had for the wedding. Thunderstorms, a quick mini heatwave of humidity and then a cool down. Despite that, we are celebrating by going back to our beginning, with a trip to where we had our first one on one date. Off to the Toronto Zoo to relive some memories…mind you, we won’t be heading to the Canadian region mind you (seriously if you know our zoo, you know how you do NOT do it in a wheelchair…unless you have 5 friends who can share pushing duties). This time though, we won’t spend 3 hours in the Tim Horton’s down the road. A good dinner, a drive, then home to relax with our dog as we discuss our anniversary trip next year. We were so fortunate that we both had great friends who worked to set up getting us together. It began with my crashing a New Year’s party and seeing this woman who I wasn’t sure was there on her own…and saying “I guess you’re stuck with me” as midnight tolled. To the conspiring of our friends, Kim and Connie, to get us together for a poker party on my birthday, where Shannon was so sick she never should have been there. To the curling bonspiel that rescued that attempt (thanks Matt!). It took a while to finally get together, with days of phone calls while Shannon was at a union annual general meeting downtown…but its a time we both remember so well. It seems only right that we should go back to the beginning as we start our next decade together. It’s been a long while since I’ve had the urge or inspiration to post, but this seemed the perfect time to change that. September was SCI Awareness month and there was a wonderful campaign sharing stories of SCI Positivity. 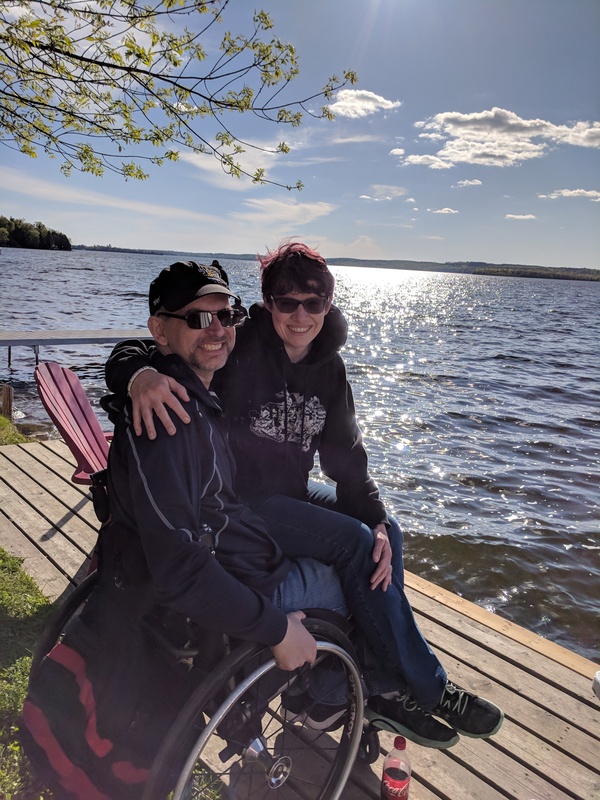 Shannon and I look at our lives and we know that my wheels don’t define who we are or what we do. It’s just another part of what makes our love and marriage unique to us. Out perspectives, how we see each other and everyone in our lives has changed for the better in all that time. We’re the better for it now. So now, its time for bed. I didn’t really sleep that night as I ran over everything we had planned for that day…and still we’d missed how the heck to get Shan to her parents place without me seeing her before the ceremony. We made it work. That’s our mantra to this day. Hopefully I’ll sleep now, but I won’t be shocked if I don’t. It will fit the day perfectly. Happy anniversary my love. My thanks too all who have stood with us. Here’s to another ten years of adventures and love. This is beautiful you two lovebirds. My congratulations go out to you both and prayers for many more wonderful years. Isabelle.